We Want to Help You Breed the Best Possible Foal From Your Mare. Breeding a racehorse is an intriguing challenge; a blend of art and science that relies on a depth of knowledge about bloodlines, nutrition, and equine management. In short, what works and what doesn't. Scientists and pedigree analysts research genetics and many have claimed they can produce that perfect match, but as we all know, Lady Luck plays a part! There are many obstacles to negotiate before your “pride and joy” reaches the racecourse, so the people you entrust to manage the foaling, rearing, breaking, and education of your thoroughbred are vitally important, before you even start thinking about selecting the right trainer! Here at Mickley Stud, we are passionate about a horse being allowed to be a horse. We know from experience that they must be allowed to interact with other horses - and humans - as much as possible, from when they have the security of being with Mum, and mixing with others in a herd, to when they are weaned and having to find their place in the pecking order within a social group. This stands them in good stead when they have matured and need to put their determination and fearlessness to the test in the hustle and bustle of a race. 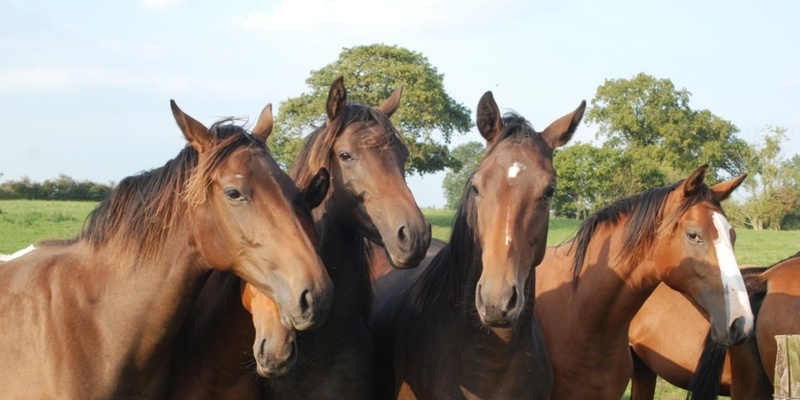 Mickley Stud horses are reared to be confident enough in their own skin not to feel threatened by others in close proximity, when the pressure is on. We are also passionate about feeding the horses in our care high quality feedstuffs in the correct quantities at the right stage of their development. Over-feeding or under-feeding will inevitably have a detrimental effect of the end result and it is vital to get these early stages right. When you’re winning, we’re winning and there is nothing that gives us more pleasure and joy than to see your commitment and investment rewarded when you have a winner.